In partnership with Third World Improv, the Singapore Improv Festival is proud to present piYEStang Pinoy! An improv comedy show for mga Kabayang OFW! Representing the Philippines with a record high of 8 Filipino teams at the Singapore Improv Festival, Third World Improv delegates are here with a passion to give back to the community. TWI hopes that their show – dedicated to their fellow Filipinos based in Singapore – brings the familiar and comforting flavor of home to Pinoys away from home. Based in Manila, Philippines, Third World Improv (TWI) is one of the leading schools of improvisational theatre in South East Asia. Founded in 2015, TWI now has several students and graduates who regularly perform unscripted and on-the-spot improv comedy shows. These performers range from high school students to corporate professionals, but they all come together with the goal of using their diverse backgrounds to tell relevant, creative, and meaningful stories. Because of their Filipino roots, the TWI performers also aim to tell these stories with a unique Pinoy point-of-view. Ranging from commercial events, corporate performances, and even international festivals, TWI performers create a fun and out-of-the-box experience for all kinds of audiences and they look forward to bringing this to the Singapore improv scene as well. Admission is free and seats are allocated on a first-come-first-serve basis. All OFWs are welcome! Whether you've got zero improv experience or one metric tonne, we have a workshop for you! Grab a friend and come down to feel the improv magic for yourself. All ages, shyness levels and experience levels are welcome. Improvisation is for Everyone! The Improv Company presents its signature introductory improv class. Designed as a fun, easy workshop that is suitable for any age or personality type, join us to learn a little bit about improv theatre, and try your hand at making stuff up on the spot! We'll teach you the basics of improvisation and how it can help build creativity, resilience and a strong spirit of collaboration in all aspects of your life. Expect to have plenty of crazy fun along the way! Founded in 2013, The Improv Company is a Singaporean improvised theatre company dedicated to performing, popularizing and teaching high-quality, instantly accessible improvised theatre. We organised the inaugural Singapore Improv Festival in 2016, are repeating the journey with the Singapore Improv Festival 2018, and have brought the joy of improv to over a thousand people in theatres, workplaces and homes all across Singapore. Find out more about us on Facebook or via our website improv.sg! Some of the top organizations in the world are using improvisation based principles and exercises to improve the way they do business. This introduction to Applied Improvisation workshop introduces participants to the use and practice of improvisation in the workplace. By the end of this workshop on Applied Improvisation, the participants will be able to define applied improvisation, identify use cases of applied improvisation in various industries and communities, determine appropriate applications for improvisation based training and finally, design and run a simple applied improvisation exercise. Gabe is the Executive Director of Third World Improv, the leading school dedicated to the art and practice of improvisational theater in the Philippines and is the founder of SPIT Manila which has performed in the improv festivals of Los Angeles, Hong Kong, Beijing, Chicago, New York, Amsterdam, Bogota and Singapore. As a consultant, Gabe specializes in workshops on Applied Improvisation, Presentation Skills, Pitching for Startups, Change Management, Problem Solving, Train the Trainer and Storytelling for Business. In 2016, he was elected to the board of the Applied Improvisation Network, an international organization of consultants who use improvisation techniques in human and organizational development. He has led workshops in the AIN World Conferences in Amsterdam, Berlin, Oxford and Austin. Chicago is famous for grounded, honest, relationship-based improvisation scene work that produces deep laughs and deep sighs as the audience is moved to both. This style of work requires acting, listening, openness, patience, and responding through a shared process of give and take. This workshop will feature a deep dive into this process of two-person scene work that will bring improvisers discovery upon discovery. As those shared discoveries pile up, the improvised scene becomes deep, full and funny. It's the Chicago way. Jonathan Pitts is an award-winning international improv theatre artist from Chicago with over 30 years’ experience. He’s a creator, director, improviser, producer, and teacher, and he’s also the Founder and Executive Director of Chicago Improv Productions. He co-founded the Chicago Improv Festival and produced it for 20 years, along with other national improv, comedy and podcast festivals and tournaments. He has created the improv shows, “The Make ‘Em Ups”, "The Oracle", "The Silent Movie", “Solo Plus One”, “Stopwatch”, "Storybox Unscripted Theatre". He taught at The Second City for 16 years and he’s a contributing writer to their book on improvisation. He’s also taught at 25+ American cities at regional improv fests and improv theatres. He has taught and performed internationally in 12 countries in over 1,250 improvised shows. For 3 consecutive years he was selected by New City magazine as one of Chicago's Top 50 Theatre Players and he’s been interviewed about improvisation in books, newspapers, online posts, podcasts, radio, and TV. His teaching philosophy is to help every improviser become a more intuitive theatre artist and to face artistic challenges with creativity, braveness, openness, a sense of exploration and a sense of humor. This workshop will focus on strategies to avoid and overcome some of the major problems female providers encounter and complain about most. Stop getting frustrated, and learn strategies to improvise the way YOU want to improvise. Grab your ovaries and do the scenes that you want to do. Alison has been teaching improv since 2002. She has her BFA from NYU Tisch School of the Arts, and a Masters in education from University of Saint Thomas. She studied improv at The Second City, UCB, iO, ComedySportz, the Annoyance Theatre, the PIT and Station Theatre. Put two people in a room and you’ll see the animal instincts kick in as the struggle for dominance begins. The seasoned improviser knows how to recognise, understand and control the subtle and unspoken behaviors that humans use to cement their place in the pecking order. This workshop teaches you to recognise these behaviours, learn how to use them in your scenes and gain self-awareness about yourself and how your unconscious behaviour affects how people perceive you. Improvisers will also learn how to use this knowledge to better engage with their scene partners. Kim is the Artistic Director and cofounder of The Improv Company, the pioneering improv theatre in Singapore. He’s performed and trained in improv theatres and festivals all across the world, including the US, the UK, Australia and in many countries in Asia. He’s also a board member of the Applied Improvisation Network. All these efforts and more are part of his contribution towards the founding vision of The Improv Company: to bring the power and transformativeness of improvisation to Singapore. How much do you really care about your scene partner? Concerned with the idea that we know we want to embrace the offers of others, “Unconditional Improv” has a focus on our scene partner, listening, observing, endowing them, etc, BUT these are practical measures to emulate actually caring about them. They do work. We do end up caring more about each other, and focussing on each other, but we can also do a range of work that more directly and honestly causes us to genuinely care about our scene partners, our audience, and ourselves, so that practical skillsets like embracing their offers and endowing them will occur completely naturally by default. Unconditional Improv is a platform for good performance and for healthy group dynamics that influence good performance. The idea has arisen, because I realised that it was what I was doing myself in class and on stage when I am at my best. This work leads to a very warm format called “Agape”, which will be featured onstage in the festival. Nick Byrne is Artistic Director and the creator of Improvention; Australia’s largest international festival and convention of unscripted theatre, and is the founder and teacher of Impro ACT, Canberra’s major improvisation company for more than a decade. In the field of applied improvisation, Nick has taught United Nations peacekeepers to be culturally sensitive on international deployments, even improvising with Secretary General Ban Ki-moon. He has also worked with Olympic Athletes to deal with off-field adversities, and helped educators at the National Gallery of Australia to give satisfying experiences to niche tour groups, such as dementia patients. Nick believes improvisation to be a lifestyle and an ethic. He believes that theatrically, improvisation is a choice of technique, no better or worse than any other, and that there is no reason to prove we are improvising - we simply either do good theatre or not, that happens to be improvised. He believes that whilst certain elements require experience and skills, mixed-level casts can often create the most genuine experience. Nick believes that a scene is never about “going to the zoo” - rather that his experience on stage is all about his relationship and his collaboration, with his scene partners and the audience. He believes in bold risks and relentless experiments. There is a whole world of details possible in the practice of improvisation that is often overlooked, but can offer great gifts to our scenework! Learning to really notice the details in the environments, locations and in our partners will propel our scenes forward. This workshop will feature loads of playtime, discovering just what is available to us if we choose to really see the worlds we're creating. 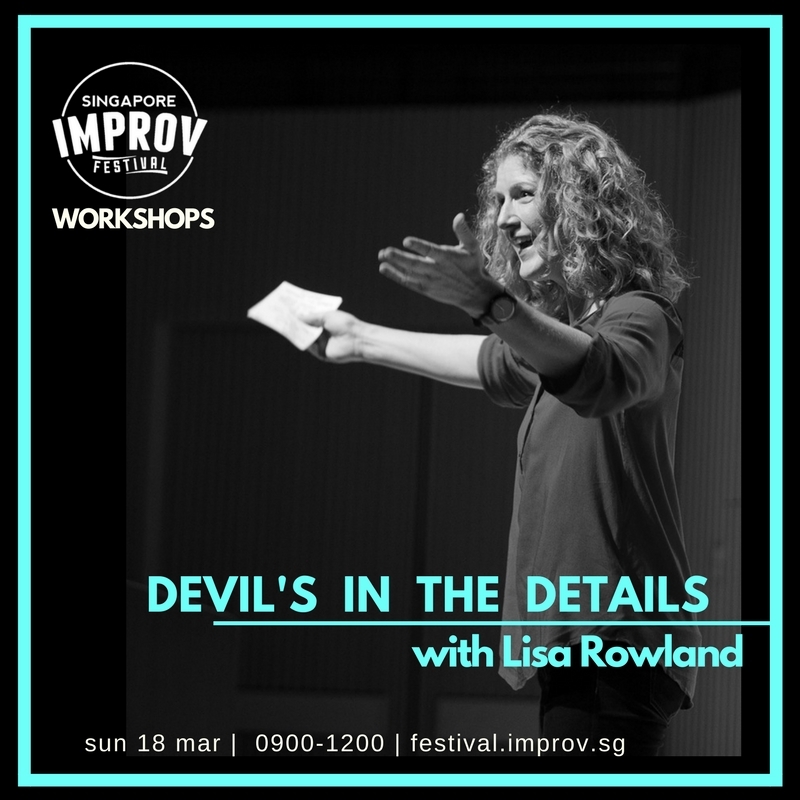 Lisa Rowland is an improviser, lecturer and trainer. Based in San Francisco, Lisa lectures at Stanford University and trains improvisers at BATS Improv, Northern California’s longest-running improvisational theatre company, and is a founding member of the Improv Playhouse of San Francisco. She is also a co-creator of Monster Baby, a podcast that explores the crossover between mindfulness and improvisation. Hear it straight from the horse's mouth - we've got real, actual quotes and ratings from our happy audiences.